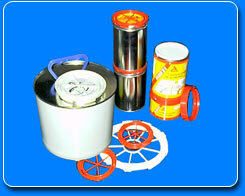 for use with homologated canning. Transportation of liquids and hazardous materials. These cans have a wide opening for easy use. The cap is mounted with a secured plug to ensure total watertightness. The cap is also guaranteed child safe. - Diameters : 99, 100, 108, 109 et 180. - Heights : minimum 64mm, maximum 300mm.